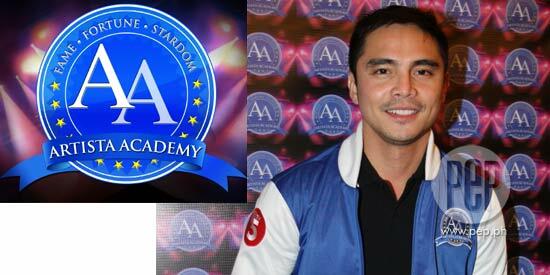 Marvin Agustin (in photo) hosts TV5's Artista Academy along with Cesar Montano. Sixteen of the 75 hopefuls will be granted full scholarship to the Asian Academy of Television Arts (AATA). The identities of the Top 16 will be revealed this Saturday, August 4. "The announcement of Artista Academy’s 16 finalists will happen this Saturday, August 4, as TV5 names the select group of young showbiz aspirants who will battle it out for P20 million worth of total prizes in the country’s biggest and most intensive artista search. "Out of the 13,000 who flocked to the SMART Araneta Coliseum for Artista Academy’s one-day grand auditions last June 19, only 300 advanced to the next level. After a series of screenings and meticulous elimination of the Artista Academy executive committee, only 75 candidates remained to face the final cut. "This Saturday, only 16 of the 75 hopefuls will be granted full scholarship to the Asian Academy of Television Arts (AATA) to train under the best professionals in the industry, including multi-awarded director Joel Lamangan, music master Louie Ocampo, dance guru Georcelle Dapat of G Force. "On top of the P20 million in total prizes to be won by Artista Academy’s Best Actor and Best Actress, they will also be given lead roles in a forthcoming TV5 teleserye. Not only will they be equipped with the proper training to become TV5’s next big stars, they will also be the richest winners in the history of all talent searches in the country. "Hosted by Cesar Montano and Marvin Agustin, Artista Academy airs Monday to Saturday after Wil Time Bigtime on TV5. "This Saturday, Artista Academy will name the 16 Students who will get the chance to prove themselves worthy of fame, fortune, stardom and the glamorous artista life all showbiz hopefuls dream of."